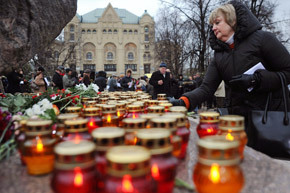 A woman place a candle at a memorial to the victims of Soviet-era political repression, the Solovky Stone monument, on Lubyanka Square in Moscow, on October 29, 2012. Dozens of people gathered today to remember the victims of Soviet-era political repression in central Moscow at the Solovky Stone monument, a giant slab of stone taken from a Soviet labor camp in the Solovky Islands and brought to Lubyanka Square near the former KGB headquarters. Source: AFP/East News.